Number 13 in the Irish Historic Towns Atlas series, Fethard traces the development of the County Tipperary town of Fethard from its earliest times to 1900 and includes: a large color reconstruction of the town in 1840; two early 18th century maps by Redmond Grace, followed by maps by Steile and Swiney from 1752 and 1763, respectively tracing the town's growth for that period; an attractive estate map based on the 1845 Ordnance Survey; and two Ordnance Survey maps showing Fethard in its surroundings and the modern town. 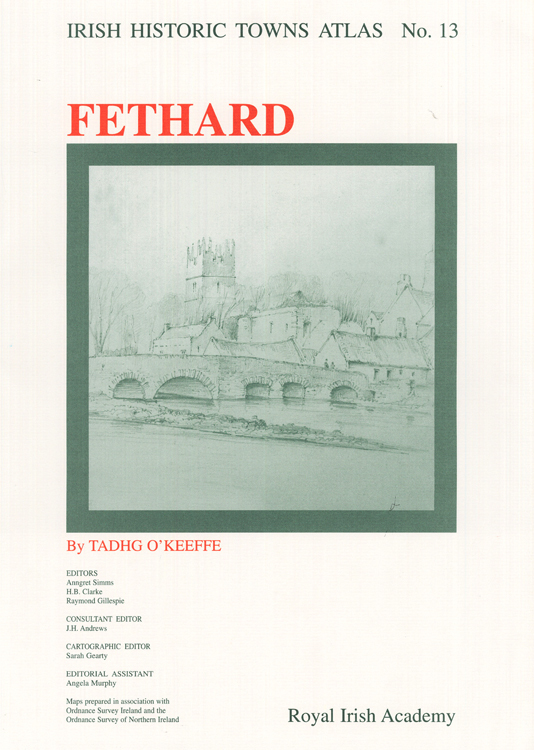 Fethard also includes a topographical information section that lists historical and archaeological details of over 380 sites and an essay, all tracing the development of the town to 1900. Tadhg O'Keeffe is a Professor in the School of Archaeology at University College, Dublin. He is a specialist in medieval architecture and has published numerous books and essays on the topic. Amongst his publications are Irish Historic Towns Atlas, no. 13, Fethard (2003) and Irish Historic Towns Atlas, no. 27, Youghal (2015) with David Kelly.